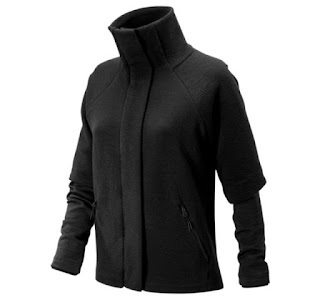 Today only get these New Balance Women's Intensity Jacket for ONLY $24.99 (Retail $119.99)! You'll stun the winter masses in the athleisure-inspired Fashion Jacket for women. Its stylish oversized profile is made with performance technology for a look you can throw on post-workout and take to the streets. NB Heat fabric at the sleeves and neck offer the ultimate in warmth, stretch and quick-dry comfort, while hidden thumbholes work to keep your wrists cozy. Plus, a high-low hem, asymmetrical cowl neck, and pleated back detail mean you'll look good both coming and going. Want to bring warmth and style on an errand run? Two zipper pockets safely stash keys, cash, and more.